It’s nearly impossible not to gorge ourselves over the holidays. We basically spend weeks on end going from festive party to festive party, grabbing baked goods, sweets, and various buttery snacks everywhere we go (like seriously…everywhere. Even the office isn’t safe). So it doesn’t hurt to have some healthy holiday options when you need to bring something to an event, right? And we’re not talking about boiled carrots, or bland salads. We mean healthful options that you’ll actually want to eat. Because as much as we look forward to our annual holiday feasts with friends and family, we don’t necessarily look forward to the weeks-long food coma that ensues. 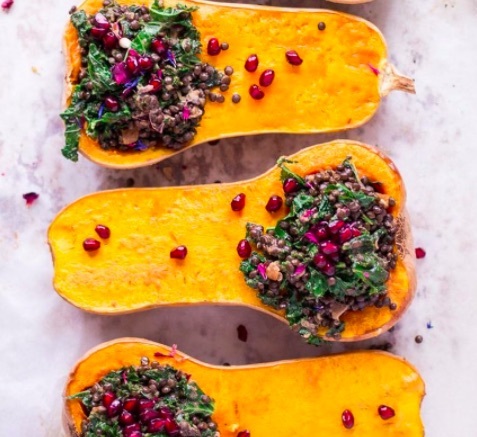 Thus, we’ve compiled a list of seven healthy holiday-inspired dishes that will bring you the best of both worlds: Deliciousness and nutritional goodness. Both your bodies and tastebuds will thank you. We promise. From the popular German blog Heavenly Healthy, this recipe is great if you’re a vegan, have a gluten allergy, or just love squash. It’s also fancy AF, so if you’re cooking to impress, look no further. Kale? Lentils? Pomegranate? EDIBLE FLOWERS? It’s on. This one’s a classic — and it’s quick! It clocks in at about 25 minutes, and — if you’ve been at a dinner party with Millennials lately — you already know brussel sprout salads are a crowd-pleaser. Who doesn’t love a sweet and savory salad with a good crunch? Thanks, Cookin’ Canuck! The prep for deliciously hearty casserole will only take you about fifteen minutes, and the result is not only yummy, but good for you, too! And the cream sauce (coconut milk, chicken broth, yeast, eggs, tapioca flour, and some herbs and spices) sound to die for. This soup may look a little different, but it’s packed full of healtful goodness. Blogger Rachael Finch’s concoction includes pumpkin, kale, garlic, carrot, and onions. Easy right? After boiling the pumpkin, blend everything in a Vitamix with some salt, pepper, nutmeg, and almonds, and voila. A wholesome and scrumptious soup! This salad is both healthy and filling. We also always LOVE the goat cheese, cranberry, and pecan combo. After you finish cooking up the farro (about 15 minutes), the rest is a piece of cake. Stuck on Sweet blogger Jessica Erin also says you can sub out goat cheese for feta. Yum. Mashed potatoes are hands down one of the most comforting holiday-time foods. We can literally see that creamy, buttery goodness in our dreams. Luckily, A Sweet Pea Chef has come up with a recipe that’s both delicious and good for you. Sure, cauliflower mashed potatoes don’t taste exactly like the real thing, but they’re still delicious in their own right. You admittedly might have to run to a health food store to get some of the ingredients on this list (or at the very least, a Whole Foods). Many of us don’t have almond meal or buckwheat flour on hand at all times. But by the looks of these photos, it’ll be worth it. Check out the link above to see Gaspic Healthy Berry’s awesome recipe. All right, it’s a bit of a stretch to call this one from Chocolate Covered Katie outright “healthy,” but it’s definitely healthier than your average option. The base is tofu, and it skips heavy cream and butter, so you’re already doing your body a favor. Oh, and it takes five minutes. Yes, five minutes. No cooking required!